I am in awe of how quickly this week has come and gone. Summer time and the living is easy (and fast). 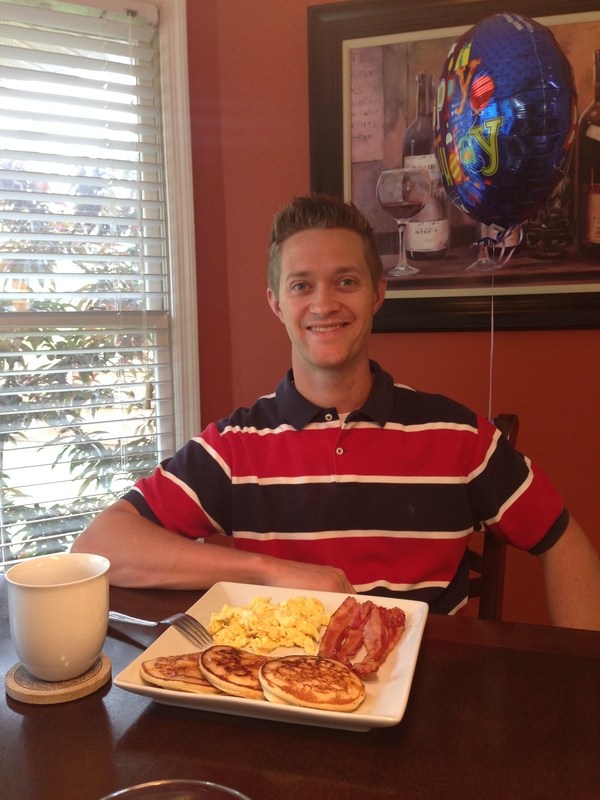 Tuesday was Rob’s 28th birthday. 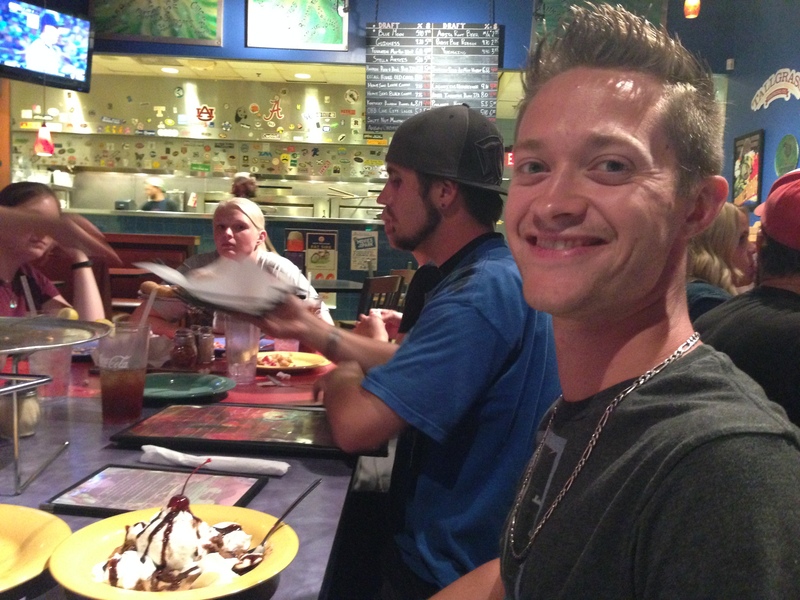 We ate very naughty that night at Mellow Mushroom with a bunch of car guys. Cheeeeeeese pizza, beer, and they even brought him out a birthday treat. He waddled into bed that night happy but overly full. It’s hard being him. For his birthday I got him a Harbinger weight belt, some wrist wraps and Reebok Olympic lifters in blue and orange. He also decided to treat himself to a set of Ray’s wheels for the 335. Like I said before, it’s hard being him. Yesterday was CFHSV’s Annual Black Shirt/Green Team test and cookout. I am not yet ready to test (next year is my year) but Rob put his heart and soul into going for it and only missed the Green Team by two skills. I am so proud of him! A few of the pictures I snapped. 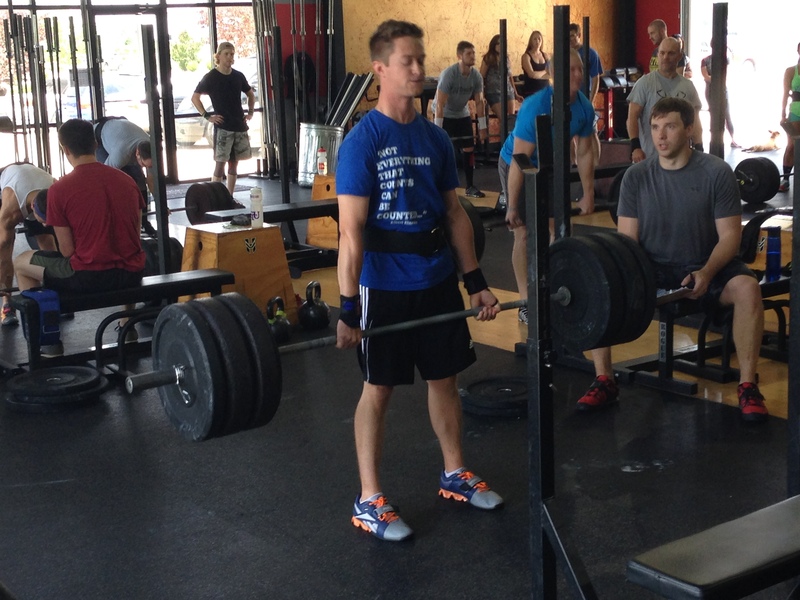 For a skinny guy who has only been crossfitting for about 8 months, he is so far ahead of the curve! The test itself took over 3 hours to complete, and was a test comprised of 30 different skills involving movements and weights. To make Black Shirt, all 30 skills had to be a go. To make green shirt, an athlete could only miss 7 and Rob just missed 9. It truly is a test of endurance, skill, strength and mental fortitude. I am very much looking forward to next year when I will be testing alongside him instead of cheering and taking mediocre pictures. It was awesome being there all day with my closest friends, doing what we love, cheering each other on, and watching each other train. 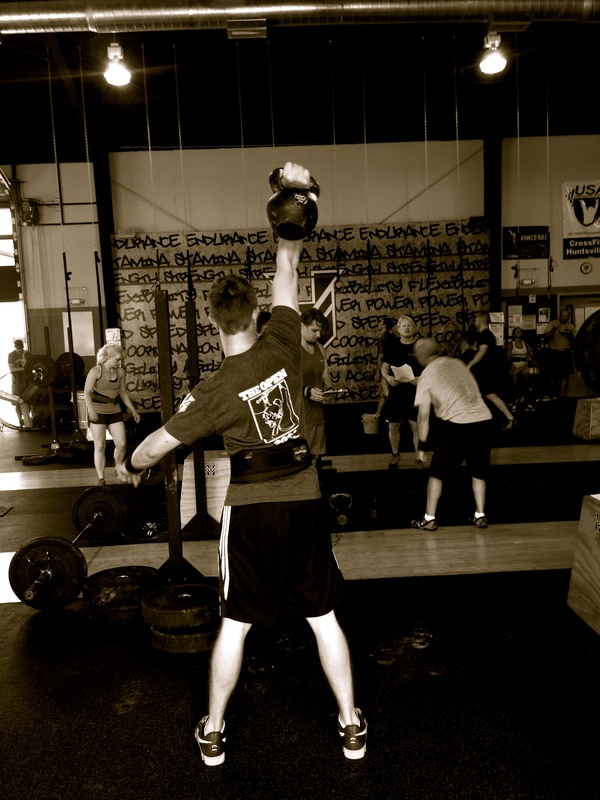 I love Crossfit with my whole body and soul, not because of any one thing, but because of ALL the things it embodies. I feel so lucky to have found CFHSV and all of the coaches and friends I have made there have been so instrumental in shaping me as a happy adult. Refinement is physically and mentally painful sometimes, but the peace and happiness that comes on the other side of those growing moments is such a reward. And I can honestly say, I have never found a more encouraging and accepting group of friends than what I have at CFHSV. Especially the females. We empower one another, we chase one another’s accomplishments and PRs, we lift up and celebrate each other daily. I don’t know where else that exists because I hadn’t found it in the 27 years I had looked before starting crossfit one year ago this month. I’m sure glad I’ve found it now. Found myself in all of it too. 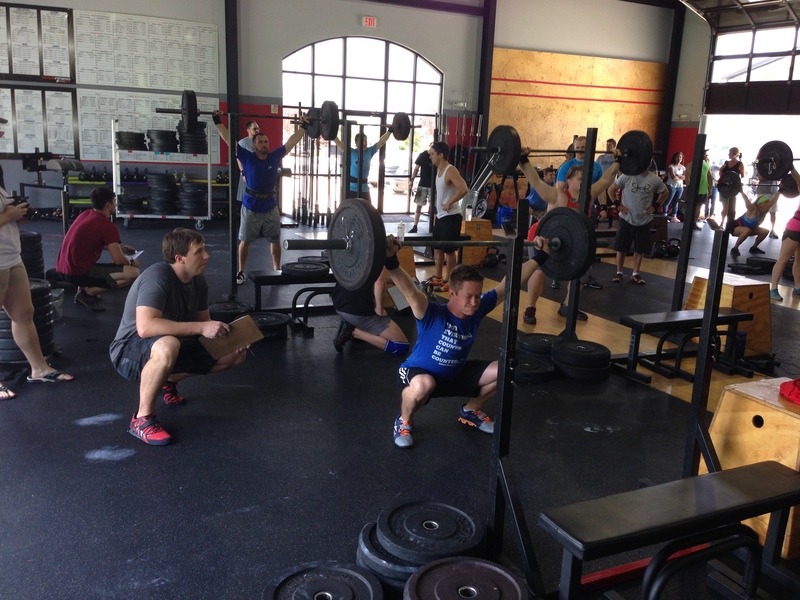 I downloaded this app called MyWOD. It’s such a great tool primarily because it makes it easy to look up your PRs and weights on different movements easily as well as integrate into your box’s feed. There are a dozen other cool specs about it too. I still journal though I am on my last page, but the app is more efficient. Half the time during weight training I waste time flipping back through my book to look up my last stats and the other part of the time trying to add weights in my head. Math is hard. I leave you with proof that Crossfit is every bit about functional fitness as it is about strength training and endurance. 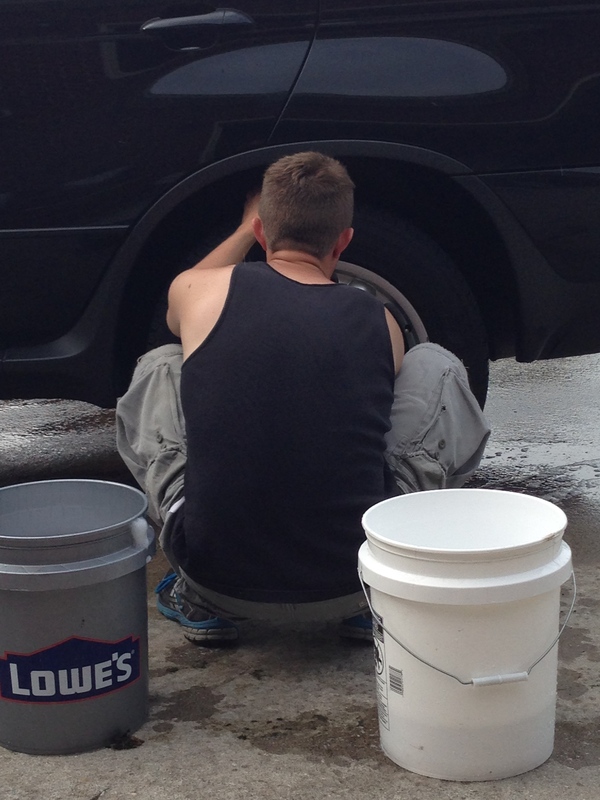 Check out Rob’s squat form as he washes the wheels on my X5. 😀 Dat depth.